The key report for this week will be the February employment report to be released on Friday, March 4th. 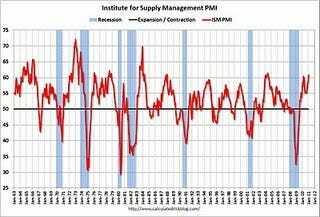 Other key reports include the Personal Income and Outlays report on Monday, the ISM manufacturing index on Tuesday, vehicle sales on Tuesday, and the ISM non-manufacturing (service) index on Thursday. Also Fed Chairman Ben Bernanke will deliver the Semiannual Monetary Policy Report to the Congress on Tuesday (Senate) and Wednesday (House). 8:30 AM: Personal Income and Outlays for January. The consensus is for a 0.4% increase in personal income and a 0.4% increase in personal spending, and for the Core PCE price index to increase 0.2%. 9:45 AM: Chicago Purchasing Managers Index for February. The consensus is for a slight decrease to a still very strong 68.0 (down from 68.8 in January). 10:00 AM: Pending Home Sales for January. The consensus is for a slight decline in pending sales (a leading indicator for existing home sales). 10:30 AM: Dallas Fed Manufacturing Survey for February. The Texas production index was down sharply last month to 0.2 (from 15.3 in December), but is expected to show improvement in February. 10:00 AM: ISM Manufacturing Index for February. The consensus is for a decrease to 60.5 from the strong 60.8 in January. All of the regional manufacturing surveys showed strong improvement in February. The PMI was at 60.8% in January, the highest level since May 2004. Some forecasts are as high as 63, and any reading above 61.4 would be the highest since 1983. 10:00 AM: Construction Spending for January. The consensus is for a 0.4% decrease in construction spending. All day: Light vehicle sales for February. 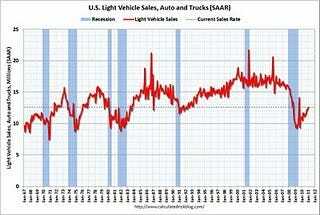 Light vehicle sales are expected to increase to 12.7 million (Seasonally Adjusted Annual Rate), from 12.6 million in January. 8:15 AM: The ADP Employment Report for February. This report is for private payrolls only (no government). 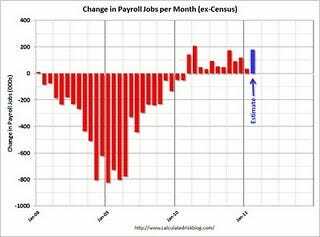 The consensus is for +180,000 payroll jobs in February, down slightly from the 187,000 reported in January. 8:30 AM: The initial weekly unemployment claims report will be released. The number of initial claims had been trending down over the last couple of months. The consensus is for a slight increase to 396,000 from 391,000 last week. 10:00 AM: ISM non-Manufacturing Index for February. The consensus is for a slight increase to 59.5 from 59.4 in January. 8:30 AM: Employment Report for February. The consensus is for an increase of 179,000 non-farm payroll jobs in February, after the disappointing 36,000 jobs added in January. This graph shows the net payroll jobs per month (excluding temporary Census jobs) since the beginning of the recession. The estimate for February is in blue. The consensus is for the unemployment rate to increase to 9.1% from 9.0% in January. 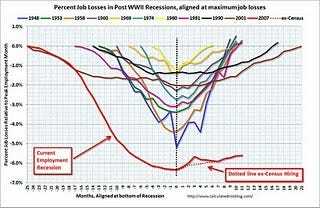 The second employment graph shows the percentage of payroll jobs lost during post WWII recessions – aligned at maximum job losses. fewer jobs in the U.S. than when the recession started. 10:00 AM: Manufacturers’ Shipments, Inventories and Orders for January. The consensus is for a 2.2% increase in orders.